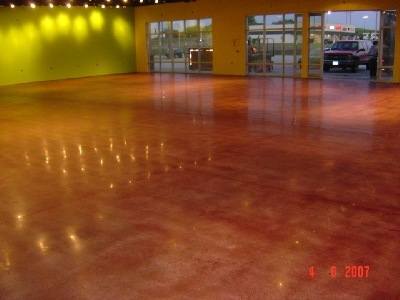 Polished concrete is a relatively new process that first came into play in approximately 2000. 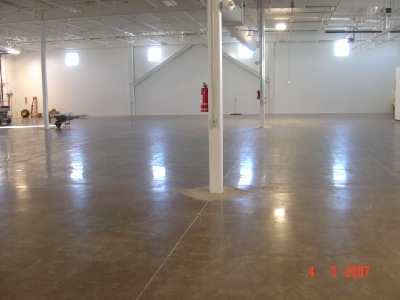 It is rapidly becoming the choice for people who choose to create a rich looking, low maintenance, low cost, long lasting floor. Since there is no coating or membrane on the surface you eliminate chipping, peeling, scratching and wear characteristics of other coatings. If light reflectivity is important to you, polished concrete reflects 35% versus 7% of a coated floor regardless of color. We apply a treatment that hardens, densifies, and dust proofs the concrete, that a life expectancy of 20 years or more is not unrealistic. 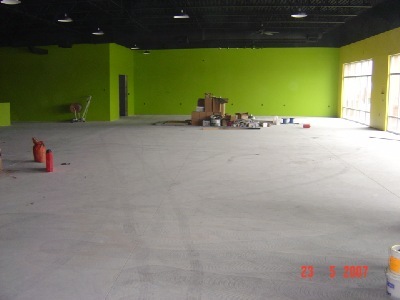 If polished concrete is the look you want, but you would like to add some color to it, dyed concrete is an option. Dyes are available in a variety of colors. 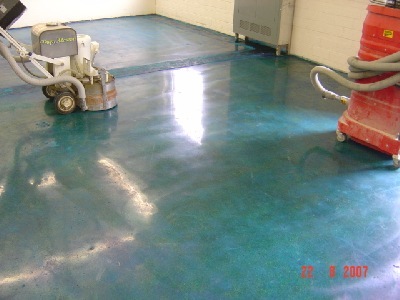 Dyed concrete is better than stained concrete because dyed concrete is a one time process. Stained concrete needs to be refreshed over time to keep the same look. Picture before polish and dye. Picture after polish and terra cotta dye. This system has become an increasingly popular way to improve the look of older concrete. 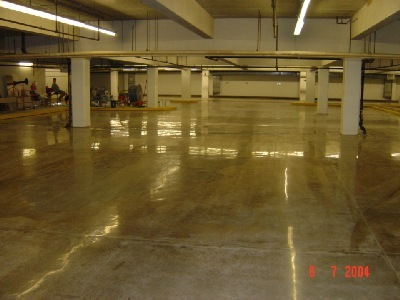 It is desired in places where clean up of concrete is an issue, and it provides a non-slip permanent fix to your problem.